Alaska Aces, the PBA’s 14-time champions. XTERRA Off-road triathlon. Ironman 70.3 races in Vietnam, Thailand, Subic and Mactan. The 5150 events in Bohol and Subic. The Alaska Ironkids. The Jr. NBA/Jr. WNBA Philippines (basketball) and the Alaska Football Cup. Fred Uytengsu — the recipient of the “Sportsman of the Year” award — has brought these contests to our shores. Apart from being President and CEO of Alaska Milk Corp., he also heads a company that has a direct impact on Cebu sports. Sunrise Events, Inc. is the outfit that has introduced the Ironman and XTERRA brands to the Phils. And for the past five years, including last year’s Asia-Pacific Championships, the triathlon world’s attention has been spotlighted on Cebu. Born in Cebu in 1961, he went on to obain a Business Administration (Entrepreneurship) degree from the University of Souther California. While in college, he was captain of the USC men’s swimming team. At the same time, he represented the Philippines as national team member and competed in the 1981 SEA Games. In 1986, he was tasked by his father, Wilfred Uytengsu, Sr., to organize a PBA team. In the storied 31-year history of the Alaska PBA squad, from the Milkmen to the Air Force to the Aces, they have accumulated 14 titles. Busy with his corporate responsibilities chairing boad meetings and wearing a suit all-day in the Alaska Milk Corp. boardroom, he longed to continue this athletic pursuits. Enter triathlon. Already a world-class swimmer, he added running and cycling to his daily exercise regimen and, in his triathlon career that has spanned a couple of decades, he has finished the Wimbledon of triathlons: the Ironman World Championships in Kona, Hawaii. Mr. Uytengsu completed the 3.8-km. swim, 180-km. bike, and 42-km. run event called the Ironman two times, recording a personal best of 12.5 hours in 2011. More on triathlon: This August marks the sixth year that Cebu will be hosting the Cobra Ironman 70.3 race — considering by participants, including the world’s elite, as one of the most fun and most organized. 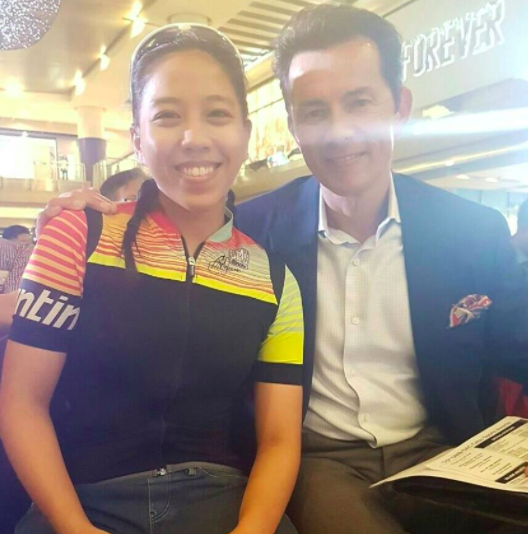 To Fred Uytengsu — who has uplifted Philippine sports, in particular helping put the brand “Cebu” in the world triathlon map — congratulations, Sportsman of the Year. Daghang salamat.